Quality of life and running a business should go hand-in-hand, but without regulations the demands of locals and the whims of tourists often collide so that nobody has fun. The administration of Mayor Peter Carlisle confirmed Friday that companies cannot conduct commercial activities — from kayak rentals to tour buses — on any city beach or park at any time without a specific license under a bill that took effect July 1. 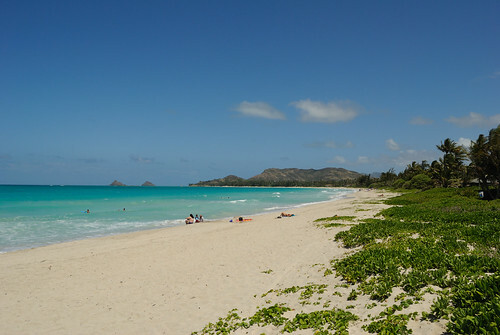 Bill 5, which the City Council introduced in 2011 and approved this year, was designed to ban business activity at Kailua Beach Park on weekends. But city attorneys have concluded that the wording of the bill also means “commercial activities without permits are not allowed” at all Oahu parks under city jurisdiction at all times, city spokeswoman Louise Kim McCoy said Friday. The city’s interpretation appears sweeping and could affect a large number of enterprises that conduct business on city parks, such as dive tour operators and food trucks. City officials said after a week of warning companies, about two dozen citations have since been issued against businesses at Kailua Beach, among them kayak rental companies. Scene at Honolulu’s Kailua Beach. Photo by Daniel Ramirez. Bob Twogood, owner of Twogood Kayaks, said his Kailua company was cited five times through Friday, and as recently as Friday afternoon. But police could be directed to issue citations with fines to businesses elsewhere. City Parks Director Gary Cabato warned Council members about the bill’s effects during recent Council meetings. But Council members pushing for a ban on commercial activity at Kailua Beach said they did not believe Cabato’s interpretation was valid. Bill 5 does allow for those operators with permits, including two windsurfing vendors, to operate on weekdays only. The interpretation of Bill 5 by city attorneys appears to nullify the impact of Bill 11, which was approved 7-2 by the Council on July 11. That bill bans all commercial activity on Kailua Beach. Twogood and other commercial vendors have urged Mayor Peter Carlisle to veto the bill. Carlisle, in recent mayoral debates, has indicated he is open to a compromise. Before Bill 11’s passage, Cabato said he had been working on rules that would allow, through a permit process, a small number of commercial vendors at Kailua Beach. But a majority of Council members, led by Windward Councilman Ikaika Anderson, said parks officials were taking too long and that the patience of Kailua beachgoers was growing thin. Anderson said he and his staff were told Friday of the conclusion made by city attorneys. A large number of Kailua residents have supported a full ban, saying the influx of kayaks and other business activity on the beach have turned a once tranquil neighborhood beach into a crowded tourist mecca. Twogood and other operators of Kailua businesses held a news conference Friday to publicly urge Carlisle to veto Bill 11. Opponents, meanwhile, stood across Hamakua Drive from Twogood’s business holding signs that urged the city to enforce existing law banning commercial activity. Regarding Bill 5 and the citations his company has received, Twogood said he believes he is allowed to operate because the city has no permitting process regulating kayaks. On Thursday afternoon Twogood was arrested after he sprayed water on opponents who held protest signs in front of his kayak rental shop. Twogood reiterated Friday that he was simply trying to cool down the protesters on a hot summer day. “They have a constitutional right to make fools of themselves,” he said. Opponents holding signs in front of his shop on Friday were not amused. Kailua resident Jan Mosher said Twogood verbally assaulted her and questioned the wisdom of taking her children to the protest. “It was very malicious and vindictive what he did,” she said. Margy Grosswendt, a Realtor who has lived in Kailua for 37 years, said city officials should enforce laws that prohibit vendors without permits from operating. “I go to great lengths to follow the law,” Grosswendt said. On the Net: View Ordinance 12-2 9 (formerly Bill 11).